Most people can remember more than a few instances when they have walked into a restroom only to be confronted with trash bins overflowing with discarded paper towels, soap and water smeared on sink countertops, and questionable liquids on the floor. Unless the building owner has someone stationed in the bathroom cleaning up after each guest, it is hard to keep your public or employee bathrooms clean. But a messy or dirty restroom can negatively color a user’s impression of an entire building or facility, even if the rest of the spaces are well maintained. 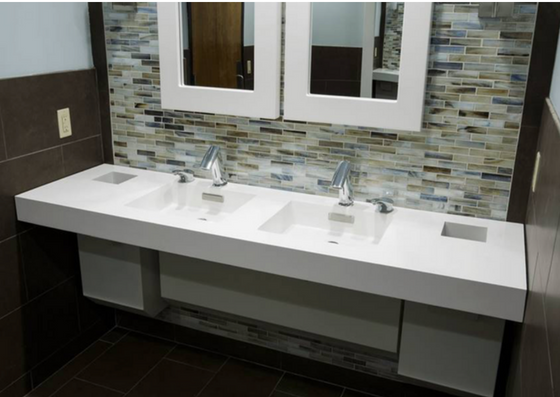 We’ve come up with a few ideas that will help keep your commercial or public restrooms clean and hygienic while creating a fresh, trendy space that people will talk about positively. Your first step should be to eliminate the most significant problem areas. By integrating paper towel holders and trash receptacles right into the countertop where they are most convenient means, there is less chance for trash to end up on the floor. You also eliminate the trail of water droplets on the floor leading from the sink to the paper towel dispenser which is typically located by the door. 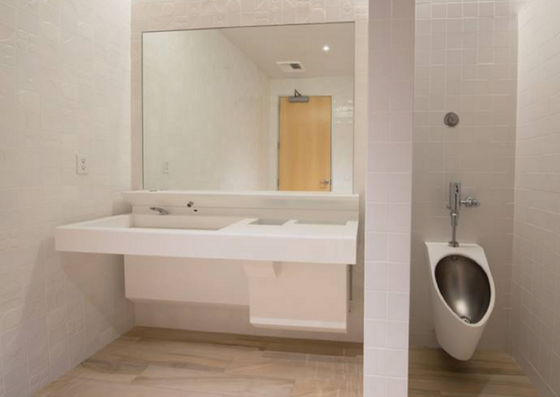 Custom stainless steel basins and Contour Urinal with a matte white powder coating. A basin shelf contains a sensor-operated faucet, soap dispenser, and paper towel well. A custom, easy to access, built-in trash receptacle, paper towel holder, and trap enclosure complete each basin. While an integrated trash receptacle is one way to cut down on the mess on the floor, you can go one step farther with a combo faucet and hand dryer. Not only can this setup reduce wet spots on the floor that are unsightly and hazardous, but it is far more sanitary in other ways. 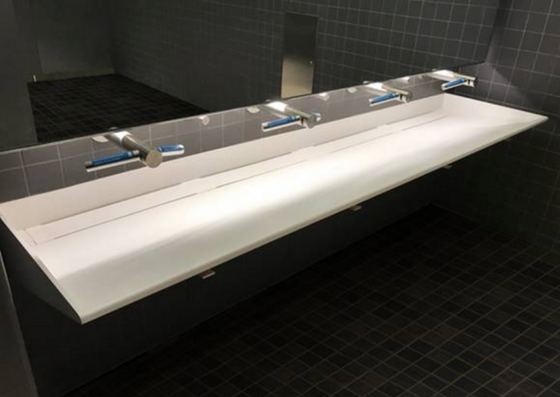 Touch-free faucets and hand dryers are one way to reduce the spread of germs in commercial restrooms. Providing users with a way to quickly and completely dry their hands is another. Did you know that damp hands can spread up to 1,000 times more bacteria than dry hands? Warm-air hand dryers can take up to 43 seconds to thoroughly dry hands—a longer time than many people have the patience for. High-speed hand dryers take only 12 to 14 seconds to thoroughly dry hands, so the chance of spreading germs is substantially minimized in restrooms designed with these types of dryers. Many high-speed hand dryers even incorporate a HEPA filter that removes 99.97% of bacteria from the air. A combination faucet and hand dryer installed as one unit right at the sink offers benefits to improve both hygiene and safety. The high-speed hand dryer in this location is convenient and quickly dries hands thoroughly. Because the user does not have to move to a separate dryer unit, dangerous and messy wet spots on the floor are virtually eliminated. Sleek wall mounted toilets, urinals, and sinks don’t just look good and save space, they make cleaning a breeze. When the cleaning crew comes in, they can easily mop the entire floor from corner to corner. Lifting your fixtures off the floor also means you have far fewer nooks and crannies where bacteria can hide and grow. The materials your fixtures are made from and how they are constructed can also eliminate hiding places for germs and bacteria. Stainless steel is a highly sanitary, easy-to-clean material and is the predominant choice in hygiene-critical applications such as hospitals and commercial kitchens. Besides iron and carbon, stainless steel also contains chromium, which forms a protective surface layer that gives stainless its corrosion-resistant properties. 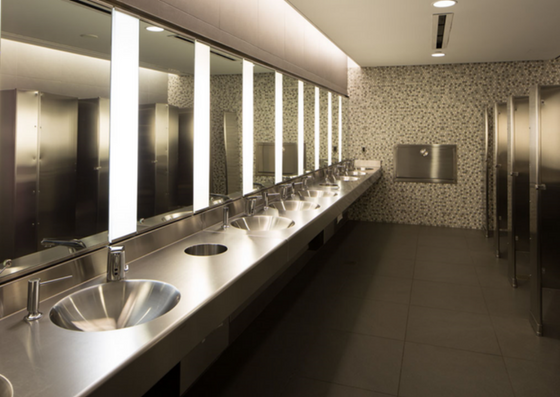 Because corrosion results in rust and pits that are hard to clean, stainless steel is ideal for the moist restroom environment. It is non-porous, so bacteria is easy to remove. 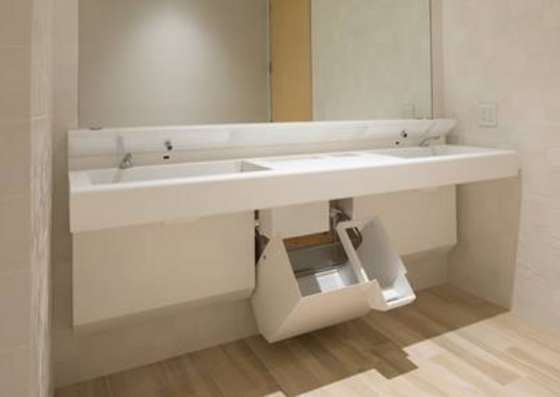 The basins in the bathrooms at the National September 11 Memorial Museum are customized straight-front washbasins with built-in trash receptacles. Because the basins and trash receptacles are formed from one seamless piece of heavy-duty stainless steel, they are easy to keep clean and will withstand the test of time. Like stainless steel, resin and solid surface materials are non-porous, smooth, and easy to clean. Soapy water or any ammonia-based cleaner will remove most dirt and stains. An additive (steritouch), which reduces the growth of harmful bacteria, can also be added to cast resin and solid surface countertops. 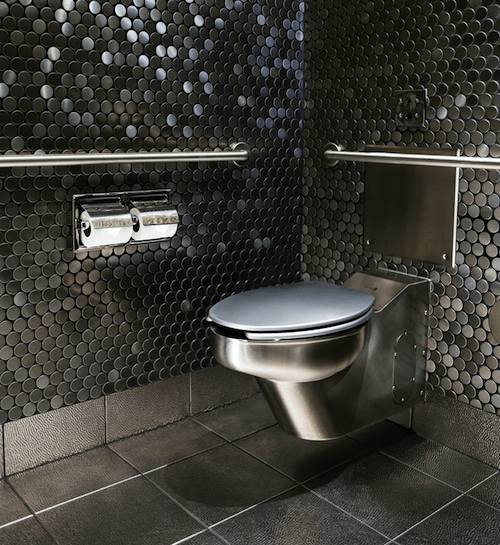 For more ways to make your restroom more appealing to the public and your employees, please read our tips on Universal Design, Vandal Resistant Bathrooms, and Sustainable Restroom Design.